New data indicates that deer are behind nearly one million automobile crashes involving animals every single year just in the United States. These creatures cause not just significant damage to vehicles but also multiple vehicle collisions and the deaths of hundreds of individuals on the road. According to a new research study though, the way to address this problem actually has to do with other animals. If you have ever been behind someone who swerved suddenly to avoid hitting an animal, you know just how easily you can find yourself in harm’s way. One of the biggest problems associated with deer is their calm demeanor and their ability to sprint very quickly can be an extreme threat to vehicles on the roadways. Deer are easily frightened and may bolt across roadways quickly even if you see them at the side of the road. Many do not know how to react to cars and thus can jump in front of your car and render significant damage. These mammals jump out in front of cars so often in the United States that the number of individuals killed by them is significantly high. Deer can also pose an additional accident threat, however. If you’ve ever been behind someone else on the road who swerves quickly to avoid striking an animal, you may be unable to adapt your own driving judgement quickly enough to avoid an accident. This could lead to multiple people being severely injured as a result of one person’s changing behavior due to animals on the roadway. Some people are not familiar with how to avoid deer or may be travelling too quickly in areas with a high deer population, making the likelihood of a crash all the more significant. A deer hitting the front of a vehicle could cause significant damage and cause the vehicle to spin, flip over or come to a complete stop extremely quickly. If you are following behind another driver like this, it is unlikely that you will have the appropriate reaction time to be able to stop your car or get out of the way of a vehicle accident. Although some of these are truly accidents, other individuals swerve far too quickly or are distracted and do not realize obstacles on the roadway and can thus cause accidents. In any situation where someone’s distraction may be linked to the cause of the car accident, you may be entitled to pursue a personal injury claim after speaking with a knowledgeable car accident attorney. There are many different causes of accidents in the United States and while true accidents like striking an animal that jumped out of nowhere or manufacturing defects causing a breakdown of car parts are truly accidents, other causes like drowsy driving, distracted driving, drunk driving and driving recklessly can all be tied to a driver’s negligence and may form the basis of a Florida personal injury claim. 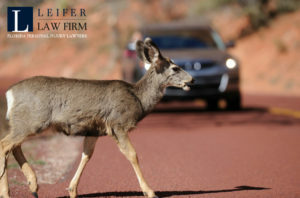 According to the research study exploring the impact of deer, there are more than 1.2 million vehicle crashes across the United States linked with 200 deaths of travelers, as reported in the Claims Journal. The costs associated with these accidents is upwards of $1.6 billion. According to the research project, erecting barricades and building safer roads are certainly part of the way to address the problem, but if eastern cougars return to their regular historic range in the United States, they may be able to keep the deer population under control and minimize the amount of serious accidents that have happened. If you have recently been injured in an accident caused by someone else’s negligence or if you need further information about how to handle a personal injury claim, you need to consult with a Florida car accident attorney as soon as possible to evaluate your rights. You may be entitled to recover compensation that could be critical for allowing you to move on with your life successfully. Did you know that your attorney can help you navigate working with your insurance company post-accident?